The Urban Horticulture Program provides integrated landscape management information and education to the professional landscape industry, and to homeowners through the Master Gardener Program. Continuing our collaboration with the Marin Municipal Water District, more than 30 Master Gardener volunteers provided consultations to approximately 150 property owners. Consultations included helping property owners reduce the amount of water used in landscapes by assisting them with garden and irrigation design, identification of maintenance issues, and plant selection. 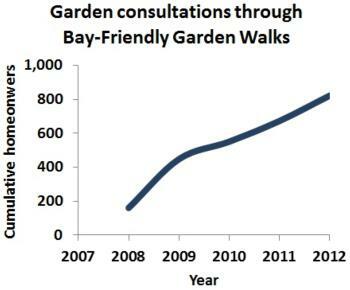 Known as the Bay-Friendly Garden Walks, the partnership completed its 5th season serving 149 gardeners this year and 806 gardeners in total. Our project team continues to advance the growth of community gardens and the quality of gardeners experience in existing Gardens. 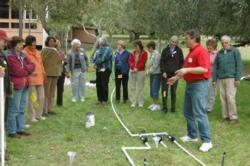 The Marin Master Gardeners provided technical assistance to 30 school gardens and 8 community gardens countywide. 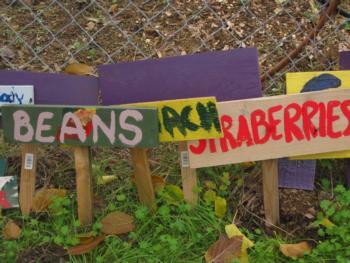 This included supporting more than 5,900 students, and more than 300 community gardeners countywide. Our volunteers are key partners with specific projects and programs like the Canal District and Corte Madera Community Gardens, as well as Homeward Bound’s kitchen garden. Our team also held the second Community Garden Summit with more than 65 participants sharing stories of progress and tackling obstacles to success for community gardens.